Vols. for 1912- compiled by: the secretary; translations by: W.G. Burniston and Roberto L. Luaces. Camaguey Prov. -Walfredo Rodriguez, Camaguey. Oriente Prov.-Thomas R. Towns, Holguin. Roberto L. Luaces, Thomas R. Towns. Article 1. -The name of the Association shall be THE CUBAN HORTICULTURAL SOCIETY. Article 2.-Its object shall be to advance the horticultural interests in all its branches. Article 3-The members of this Society shall consist of persons interested in raising the products of the soil or its allied interests. Article 4.-Any person who is interested as per Article 3 may become a member of this Society by making application to the Secretary and paying the annual dues. Article 5. -The officers of this Society shall consist of a President, one Vice President for each province of Cuba, and one for the Isle of Pines; a Secretary, Treasurer, and Executive Committee of five members, three of which shall be the President, Secretary and Treasurer of the Society. Also a Colonial Vice President for each Colony. These various members shall be elected by ballot at the annual meeting. Their term of office shall begin at the close of the meeting, and shall continue until the close of the following annual meeting. The outgoing Secretary shall be charged with the proceedings of the meeting at which he officiated, the newly elected Secretary assuming all other duties. Article 6.-The duties of the officers of this Society shall be those usually performed by the officers of like organizations. the Senior Vice President,and shall act as President in the absence of that officer. Article 8. This constitution may be added to and amended at the annual meeting, or any regularly called meeting of the members of the Society by a majority vote of the members present. Article 9-The President shall have power to remove any of the Vice Presidents for the lack of interest in the vital progress of the Society, and appoint a successor. Articulo 19-El nombre de la Asociaci6n ser6. el de SOCIEDAD DE HORTICULTURA CUBANA. Articulo 2. -Su objeto serd mejorar los intereses de la horticultura en todas sus ramas. Articulo 30-Serin miembros de esta sociedad los que est6n interesados en la cosecha de productos del suelo y sus derivados. Articulo 49Q- Cualquier persona que se encuentre dentro de las condiciones del articulo 3Q, puede inscribirse en la sociedad haciendo la petici6n al Secretario y pagando los derechos anuales. Articulo 69-Los directivos de esta Sociedad serin: un Presidente; un Vicepresidente por cada provincia de Cuba y uno por la Isla de Pinos; un Secretario y un Tesorero y un Comit6 Ejecutivo compuesto de cinco miembros, tres de los cuales deben ser el Presidente, el Secretario y el Tesorero de la sociedad. Tambidn habr6 un Vicepresidente para cada colonia. Estos distintos directivos seran electos por votaci6n todos los afios en la reuni6n anual. La duraci6n del cargo ser6 hasta la terminaci6n del mitin anual cada afio y tomaran posesi6n de sus cargos los nuevos, asimismo, al cerrarse el mitin. El Secretario saliente tendr6 d su cargo las actuaciones del mitin en que ofici6 y todos los demas deberes serin de cargo del entrante. Articulo 69-Los deberes de los directivos de esta Sociedad serin los mismos que desempefian los de todas las sociedades analogas. Primer Vicepresidente y presidird las sesiones en ausencia del Presidente efectivo. Articulo 8Q-Este Reglamento puede ser aumentado 6 corregido en la reuni6n anual 6 en cualquiera otra convocada legalmente y en ella se determinarin las adiciones 6 enmiendas por mayoria de votos de los que se encuentren presentes. Articulo 99-El Presidente tiene poder para destituir de su cargo 6 cualquier Vicepresidente por falta de inter6s en el progreso de la Sociedad y nombrar otro en su lugar. 1- The annual dues of this Society shall be one dollar American currency, and Life Membership ten dollars. 2. -The Executive Committee shall have power to fill all vacancies which occur between the annual meetings. 3.-The Standing Committees of this Society shall consist of three, or more, members and shall be appointed by the President on the approval of the Executive Committee. 4.- The Chairman of each Standing Committee shall make a written report for each annual meeting, and as often between meetings as may be requested by the Executive Committee. 3. -Marketing and Storing of Fruits. 8. -Fruits of the Temperate Zone. 12. -Diseases and Insects. 13. Legislation and Relations with Government. 14. -Entertainment. 15. -Animal Industry and Husbandry. 16.-Soils. 1. -Los derechos anuales serin de un peso americano y los de miembros vitalicios de Diez pesos por una sola vez. 2.-El Comit6 Ejecutivo tendrd facultades para elegir individuos con quienes llenar las vacantes que ocurran entre las reuniones anuales. 3.-Los Comit6s permanentes dela Sociedad se cornpondrin de tres 6 mds miembros y serin nombrados por el Presidente con aprobaci6n del Comit6 Ejecutivo. 4. -Los presidentes de las Comisiones permanentes harin un informe por escrito para la reunion anual y har6n informes tan frecuentes como le sean pedidos por el Comite Ejecutivo. 3.- Venta y almacenaje de frutas. 8. -Frutas de la zona temrnplada. 13.-Legislaci6n y Relaciones con el Cobierno. The First Six Months in Cuba, by L. A. Ward. Nature and Land. by Robert L. Luaces. Mistakes to be Avoided in Starting a Citrus Grove in 'the Tropics. by Thos R. Towns. The Absolute Necessity to Anglo-Saxons, and others Established in Cuba of Knowing the Spanish Language. by Gabriel Camps. How to Employ and Handle Cuban Labor to the BestGeneral Advantage for Farm Work. by W. G. Burniston. A Few Useful Formulas for the Pig Breeder. by Dr.. Allowing Young Trees to Overbear. by Thos. R.. Towns. Irrigation, by J. M. Arrowood, The Burning of Sabana Lands. by Robert L. Luaces.. How to Build a Cistern, by Edward Jones. Our Need of the Spanish Language, by M. F. Jackson.. Breeds of Pigs. by Dr. Emilio L. Luaces. Observations on the Effects of Clearing Forest Lands and Planning for Planting. by Robert L. Luaces. Los primeros seis meses en Cuba, por L. A. Ward. La Naturaleza y la Tierra, por Roberto L. Luaces. Errores que deben evitarse al empezar unnaranjal en los tr6picos, por Thos. R. Towns. La absoluta necesidad de los anglo-sajones y otros que se establecen en Cuba de saber el idioma espafiol, por Gabriel Camps. C6mo manejar mejor el trabajador cubano, para que de los mejores resultados en el campo, por W. G. Burniston. Unas cuantas f6rmulas litiles para el criador de cerdos, por el Dr. Emilio L. Luaces. El permitir. los naranjos j6venes la sobreproducci6n, por Thos. R. Towns. El regadio, por J. M.' Arrowood. La quema de las sabanas, por Roberto L. Luaces. Como se debe construir una caja de agua, por Edward Jones. Nuestra necesidad del'idioma espafiol, por M. F. Jackson. Razas de cerdos, por el Dr. Emilio L. Luaces. Observaciones acerca de las tumbas y los trazados de campos para la siembra, por Roberto L. Luaces. Members of the Cuban Horticultural Society, Ladies and Gentlemen. It has given me the deepest pleasure to note the large attendances at these our first meetings, and the keen interest manifested in every detail of the proceedings. 1 am particularly pleased to note the many Cubans and Spaniards present, in hearty fellowship with the AngloSaxons. Today heralds the beginning of a new epo-.h in the history of the Central and Eastern Cuba. 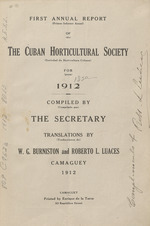 The formation of the Cuban Horticultural Society is the most important step that has taken place in agricultural interests for many years, and I most heartily welcome its advent replete as it is with wonderful possibilities for all concerned, Anglo-Saxons and Cubans and Spaniards. We have adopted the principle of co-operation as our basis, and as we all know it is the one infallible. We will grip it a3 something tangible; something to hold and to have; something that in practice will bring all our dreams of success to practical reality. blem of insects of plants life to the obtaining of the highest prices, and just recognition of our products in all the markets. We will meet each year to talk over our problems, to exchange, to co-operate in ideas and products, and I am absolutely certain that with this new Society and its excellent personnel our interests are at last to receive the recognition they have so long justly deserved. The Society will be the nucleus for the discussion of every branch of horticulture in special and agriculture in general. There is much to be done. We need papers and discussion. We wish to co-operate with every institution and individual interested in the upbuilding of the the backbone of every nation, namely agriculture. Let us look ahead individually, and collectively; grapple with the illimitable possibilities that are now ours, and realize that although young our Society is planted on such a firm basis that a greater prosperity in this beautiful country is now within reach of us all. Anglosaxons Cubans and Spaniards. Mutually is our aim, ideal, doctrine, and that is COOPERATION. Me produce el mis grande de los placeres, notar la gran concurrencia que acude d nuestras primeras reuniones y el interns demostrado en todos los detalles de ellas. Estoy tambi6n especialmente muy complacido, al notar el nfimero de cubanos y espafioles que hay presentes compartiendo de coraz6n estas tareas con los anglo-sajones. Hoy comienza una nueva epoca en la historia del Centro y Oriente de Cuba. La formaci6n de la Sociedad de Horticultura Cubana, es el paso mis importante que se ha dado desde hace muchos afios en interns de la agricultura, y yo por ello me siento entusiasmado ante su advenimiento, que ha de ser de maravillosos resultados para todos los asociados, tanto los anglo sajones como los cubanos y espahioles. Como base para nuestro desenvolvimiento hemos adoptado el principio de la cooperaci6n, cuyo infalible 4xito todos conocemos. A este principio nos asiremos como d algo tangible; como 6a algo que retener y que tener; algo que en la prdctica traera todos nuestros suefios de exito 6 una realidad. el punto principal de contacto para poder l1egar a una inteligencia perfecta, es el conocimiento del idioma espafiol, sobre cuya importancia nunca sera excesivo insistir. Nuestros interests son mutuos, desde el problema de los insectos y la vida de las plantas hasta la obtenci6n de los mis altos precios y el reconocimiento de nuestros productos en todos los mercados. Nosotros nos reuniremos todos los aios para hablar sobre nuestros problemas, para cambiar ideas sobre nuestros productos: para cooperar los unos al beneficio de los otros y yo abrige la absoluta seguridad de que con esta nueva sociedad y su excelente personal, nuestros intereses al fin recibirdn la atenci6n que tan justamente hace tiempo merecemos. La sociedad sera el punto de cita para la discusi6n de cuanto se relacione con la Horticultura en particular y Agricultura en general. Hay mucho que hacer. Necesitamos literatura y discusiones. Deseamos cooperar con toda instituci6n y toda personalidad que est6 interesada en la construcci6n de lo que pudi6ramos lamar la espina dorsal de toda naci6n: la Agricultura. Miremos hacia adelante individual y colectivamente. Aprovechemos las ilimitadas posibilidades que ahora nos pertenecen y d6monos cuenta de que nuestra sociedad, aunque joven, est6. fundada sobre tan firmes bases, que una mayor prosperidad en este hermoso pais esti al alcance de todos, no solo de los anglo-sajones sino tambidn a los cubanos y espafioles. La mutualidad es nuestro prop6sito, nuestro ideal, nuestra doctrina y esto es lo que significa la cooperaci6n. Our first six months in Cuba-possibly when we have been here a year this time will have dwindled away to such insignificance that I may not care to recall it. Be this as it may, it is, and has been, a half year of utmost importance and interest to us, for in that time I have had to reconstruct myself in so many ways that verily I do not seem to be the same man who set forth from the States such a short time ago. The chances are that a great many of you have had the same experience, and this being the case can readily sympathize with me in regard to my feelings when.I realized that all the preparations made beforehand went to naught, for in no instance was anything as anticipated. My wife and I were city broke. We went to Alabama from St. Louis on to a plantation in search, of health, and while the venture was not a howling success financially, we discovered the wisdom that city life, even at its best, had its many drawbacks as compared with country life, and having gone thus far we were prepared to go farther even unto Cuba. Our Alabama experience was a good education as it prepared us in a great measure for many of the difficulties with which we have had to contend on the Island, and I daresay, that in this respect we should consider ourselves more fortunate than many others. so as to make a success of what I have before me, and I think it is time very well spent that *I have given to this. one object. In doing this I have been brought into contact with a great many who have been here many years, men and women who have solved in a sensible and businesslike wayl most of the complex problems which, to a newcomer are at once bewildering and incomprehensible, and nearly always discouraging. They have given me advice and help which otherwise would have taken years to learn, if ever; and the willingness that this knowledge has been given has been so impressive that I may frankly say it has been to me one of the most marked features of this Cuban life; in fact, it has been so paramount to the under current of combativeness which we know exists, that I can hardly realize it, and it is to my mind one feature of the present ddy which stands forth so preeminent that we can say that. the current is a thing of the past. Let us hope that this element of helpfulness will exist. to such an extent that all old issues will be forgotten. It is a case of get together, and keep together, for it is only by this means that the industries of the Island can take their rightful prominence in the trade marts of the world, and give us the success we all aim at. This is an age of combinations, let us then Join in the movement and combine our interests. Remember this that life is in all things but a survival of the fittest, and it reursbut little observation to learn that the fittest noadys are those who are in a way joined together by helping each other to fight the battles of life which lead us collectively to the goal of success. had so carefully prepared for. It is from the many I have met and received help from that has saved me from disappointment, and possibly discouragement, and it is to them that I owe countless thanks that I have not had to travel the hard road so many of the new-comers have been over. One matter I wish to touch upon, and one I recognise is growing stronger daily, is the question of co-operation with the Cubans. I was in no way prepared for the friendliness on their part, and I can assure you that I deeply appreciate it. When I first arrived I was most wrongfully informed respecting this question; that I could not expect this, and for a time I was placed in erroneous positions which, to say the least were awkward and embarrassing and which would have ended disastrously were it not for the fact that it took me but a short time to find it was only necessary to make proper overtures on my part to do away with this undesirable feeling, and today where I' might still have unpleasantness and misunderstandings I have among, these people a host of real friends,friends whom I would not care to be without for any consideration. To those of you who have failed to grasp the situation let me say that it is up to YOU to make circumstances comfortable for you and your family and business interests by seeking the good in these people, and you will find it will not only benefit you in so many ways, but will place you in a position to render a little assistance to them, and thus have the great satisfaction of receiving it a hundredfold. I wish, and I am sure there are many others, to see the CUBAN HORTICULTURAL SOCIETY an association to include us all, foreigners and Cubans, and with this unity of forces we shall make it a business and fraternal success for us all. which may be embodied in my six months stay. Since settling in this splendid part of the Island I have come to feel that I belong here, and it was indeed a very agreeable surprise to learn we were to have a Society at home. This is a step in the right direction, and as time passes I earnestly hope t at we shall make many more such steps toward our ideal of CO-OPERATION absolutely the only principle that will bring us business as well as social success. N. B. -I have just received notice of the phenomenal success of the Societys meetings at Camagdey. Que viva la fraternidad! Nuestros primeros seis meses en Cuba; es posible que cuando tengamos un afio de residencia aqui, este periodo de tiempo aparecerd tan insignificante, que no tenga yo deseos de recordarlo; sea lo que sea, 61 es y ha sido un medio afio de la mayor importancia 6 interns para nosotros, pues en tal tiempo he tenido que rehacerme de tantas marieras que en verdad no pienso ser el mismo hombre que sah6 de los Estados Unidos hace tan poco tiempo. Seguramente que muchos de ustedes han tenido igual experiencia, y siendo asi facilmente podran simpatizar conmigo en cuanto a mis sentimientos cuando llegu6 d comprender que todos mis preparativos anteriores al viaje de nada valian porque en ningrin caso ha resultado o calculado. Mi sefiora y yo estdbamos cansados de la vida de la 'ciudad. Nos fuimos desde San Luis a Alabama d una finca de campo en busca de salud, y aunque no obtuvimos resultados completamente satisfactorios desde el punto de vista econ6mico, llegamos a conocer que la vida de las ciudades, aun en las mejores condiciones, tiene sus inconvenientes cuando se compara con la vida en el campo, y por lo tanto nos encontribamos preparados para ir mis lejos, aun hasta ilegar d Cuba. mos tenido que contrarrestar en esta Isla y no dudo que en cuanto 6A estas circunstancias podemos considerarnos m6s afortunados que otros muchos. Mis obligaciones como administrador de la Colonia Aurora son tan enteramente diferentes 6A cualesquiera otras de las que antes he tenido, que me han compelido 6 estar constantemente sobre aviso para poderme educar de manera de poder producir y dar resultados en cuanto 6 lo que se me ha encomendado, y estimo como tiempo perfectamente bien gastado aquel que he gastado y que he dedicado 6A este solo objeto. En tal labor he sido Ilevado y puesto en contacto con muchos individuos que han estado aqui largos afios, hombres y mujeres que han resuelto econ6micamente la mayor parte de los complicados problemas que al reci6n Ilegado son incomprensibles, trastornadores y casi siempre descorazonantes. Tales me han facilitado consejos y auxilios que de otra manera hubiera necesitado de afios para aprender, si acaso se aprenden, y el buen deseo y voluntad con que tales conocimientos han sido impartidos han causado en mi tal impresi6n, que puedo decir con franqueza que es y resulta una caracteristica de las m6s marcadas de esta nuestra vida en Cuba; efectivamente, ha sido tan importante que ha tomado ascendente sobre el espiritu 6 corriente de combatibidad que conocemos existe, que casi no puedo darme exacta y total cuenta de ello y se me presenta como un factor del presente que luce con tanta preeminencia que podemos decir que tal corriente es s61o un caso del pasado. Debemos desear que este elemento de mutua ayuda siga existiendo tanto que toda antigua preocupaci6n sea olvidada. Es un caso de juntarse, unirse y mantenerse unidos, pues por este medio es que las industrias de la Isla podr6n adquirir la posici6n preeminente en los mercados del mundo que de derecho les corresponde y darnos los resultados 'favorables que todos aspiramos 6 obtener. Esta es una edad de combinaciones de cooperaci6n; vamos pues a unirnos al movimiento y combinar nuestros intereses. Recordemos que en esta vida todo se reduce 6 la preponderancia de los m6s preparados y requiere poca observaci6n para conocer que hoy dia los mejor preparados para la lucha por la existencia son aquellos que de alguna manera est6n unidos ayudandose mutuamente en los combates de la vida que nos levan colectivamente 6 la meta del resultado. JPreguntar6is qu6 tienen que ver estas cosas con mis primeros seis meses en Cuba? iTodo! Vine aqui como lo han hecho otros muchos miles y vi en seguida, desde mis primeros dias, que tenia que perder mis ilusiones, volverme de reves, como quien dice, y tomar por un muy diferente camino que no era aquel para el cual me habia con tanto cuidado preparado. Debo d los tantos que he hallado en mi camino y de quienes he recibido ayuda, el haberme salvado de decepciones y quiz6as hasta de descorazonamiento, y es 6 ellos 6 quiedebo incontables gracias por no haber tenido que andar la dura senda que tantos otros recien l1egados han andado. de ain podria solo hallar incomprensi6n y desentendimiento, tengo entre esta gente una multitud de verdaderos amigos, amigos que yo no quisiera perder por ninguna consideraci6n 6 circunstancia. A aquellos de ustedes que no han podido abarcar la situaci6n, permitome decirles que en sus manos est6, que de ustedes depende el hacer confortable las circunstancias para ustedes mismos, para sus familias y para sus negocios, buscando lo bueno de esta gente y hallar6an que no solamente saldr6n beneficiados en muchas maneras, sino que tambin los pondr6 en condiciones de prestar alguna ayuda 6 ellos y asi tener la satisfacci6n de recibirlo centuplicado. Yo deseo ver, y estoy seguro hay otros muchos i igual que yo, la Sociedad Cubana de Horticultura, una asociaci6n que nos incluya y abarque 6 todos, extranjeros y cubanos, y con esta unidad de fuerzas la haremos un resultado econ6mico y fraternal para todos nosotros. Hay otro aspecto m6s de mi experiencia cubana que puede caber dentro de mis primeros seis meses en Cuba. Desde que resido Qn esta parte de la Isla he venido d sentir que j ella pertenezco y fu6 ciertamente una sorpresa agradable el saber que ibamos 6 tener una sociedad en casa. Tal acto es un paso dado en la via directa y mejor, y seg6n va pasando el tiempo sinceramente deseo que demos muchos mis de tales pasos hasta nuestro ideal de COOPERACION, que es absolutamente el inico principio que nos proporcionara resultados tanto econ6micos como sociales. P. D. -Acabo de saber del resultado fenomenal de la reuni6n de la Sociedad en Camagiey. iVIVA LA FRATERNIDAD! The prospective American settler coming into Cuba is very apt, to fall in love with the quality of the land he acquires- this is not strange when he has no knowledge of agriculture, and it stands to reason that for such men any land is good land, and the more open and flat the more he is apt to like it, although such likings may see him later on the unenvied posessor of a nice piece of poor dry savanna land, or of a beantiful mud flat. For such men very little information' can be given in a written article, unless we take the general advice given -in advertisements and magazine articles that boldly say "buy of some reliable firm, or real estate agent", which advice he appears to so often take without stopping to think or to take into consideration that nature is the best teacher and adviser. My advice in this short article will be from the point of view of NATURE. Let the newcomer look to the vegetation, and see if the tree growth is tall and thickor small and scraggy, and then select the first and leave the last to the tender mercies of the real estate boosters. Staked Plain of Texas; men of the soil, and farmers, and some who have made their mark in their native states yet have selected land seemingly with their eyes closed to the plain signs of Nature. Men who were brought up among the salt hay flats of the North Atlantic coast; among the rocks of old New-England; on the hot arid western plains; among the cacti of the South West or am6ng the lakes and swamps of Florida, come here, and take up, paying good money and high prices for land that they have known all their. lives to be very poor, and only fit for the peasant class of farmers whose standard of living is not very high. This land they acquire and live on for years, and it would appear to be so uninteresting that they cannot tell the names and uses of more than four or five of the trees among the hundreds that are growing ontheir property; they do not enquire of nature the uses of her bounty. Each variety of tree is different from the others, each takes possession of the land and grows, but each in a different way, and each has its uses and particular properties. There are soft, and hard wood trees; forests that grow straight tall timber, and forests that grow only small many branched trees. If you compare these two different aspects carefully they will tell you the message of the soil. Hard woods are common to certain soil provinces and soft woods to others, both will be found in the forest of tall timbers and in the scraggy brush, then after observation ask yourself the question, which has the more and better food? Guasumilla; the first grows on a dry soil, the latter tells us quite a different tale. The very common Guama of our pasture lands indicates a low wet soil. The Caimitillo also tells us the story of excess of humidity in the soil and at the same time that such soil is acid. Cedar indicates rich land, Mohogany poor, and Jdicaro overflow lands. Of the Palm family so conspicuous with the background of beautiful ever blue skies, the Royal Palm is the most notable. Then we have the Saw Palmetto; Yuraguana; Manaca; Cabbage Palm;. Yarey and others. The first will indicate good soil, the next dry, the next rocky, the next river bottom, the next swampy, and the last medium good land. Let us pass now to the plants that we know to our sorrow because of the harm they have done us; the Guao; Palobronco; Picapica Ortiga (poison ivy), etc. The first two indicate poor,and the last two good soil. The Guao de Costa, also a harmful tree grows on poor acid soil; the Manzanillo on low wet land; and the Chichicate or Pringamozo on some of the very best soils. Among the better known trees the Macagua indicates rich deep soil; the Majagua wet lands; the Dagame shallow soils; the Llana mud flats; the Mongrove salt soil, and the Peralejo dry land. The red,black and brown soils of Cuba all have their common counterparts in the United States as far as color is concerned, but our brothers coming from the northern and western states should examine them carefully before deciding on a purchase for such soils in this country are residuals, that is, are formed from rock decomposition, and the rock of their origen can be found a little below the surface and on it lies the subsoil. The transported soils of Cuba (*) are only to be found in small portions on the banks of rivers. These same colored soils in the United States,. as; far west as Kansas, and north west as Montana are the products of *transportation by i-e (glacias) in prehistoric times; those of the Great Basin (Nevada) were laid down from still water (lacustrine); parts of the rich and deep soils of the valleys and plains of the Rocky Mountain region and of the Pacific and Atlantic: coast are of alluvial (river transportation); colluvial (hill disintegration); and less (* *) (wind formation); such are found in the States of Colorado, Wyoming, Montana, Washintong, Oregon, California, South Dakota, New Mexico, the Carolinas, Georgia, Alabamama, Missisipi, Luisiana, Florida and Texas. Considered as such transported soils their chemical and physical properties must be different from those of the same colored soils of Cuba. The lands of the Appalachien and Piedmount regions; the limestone or blue grass country of Kentucky, Tennesse and Missouri; the residual praries of Kansas, Oklahoma and Texas can be considered more like the soils of Cuba in -irture of their residual formation, although climate will, of course give each many properties riot common to all, as also will the character of the rock from which they come. Soil colors are not true indications of soil values, yet as a rule the red soils of Cuba are deep, rich and well drained. The black color of some soils is caused by organic matter (humus) so the darker the color the richer in such plant food we can consider them. Clay soils are apt to be wet. and sandy soils too dry, so the. happy medium, LOAM, can be considered the ideal farm land. El norteamericano que lega d Cuba con idea de fijar su residencia aqui, es f6cil que se enamore de la calidad del terreno que adquiere; tal cosa no es extrafio cuando desconoce en absoluto la Agricultura y es de raz6n que para tal individuo cualquier terreno es bueno y mientras m6s abierto y llano m6as probable es que le guste 6 pesar de que tal gusto puede que lo yea m6s tarde el no envidiable duefio de una est6ril sabana 6 de una bella tembladera. Mi consejo en este corto articulo ser6 dado desde el punto de vista de la Naturaleza. El reci6n Ilegado debe de fijarse en la vegetaci6n y ver si los 6rboles crecen derechos y altos 6 pequefios y jorobados, para escoger de los primeros y dejar los il1timos al cariflo de los agentes. tado de Pennsylvania; desde los terrenos adyacentes d las costas del Golfo Mexicano; desde los valles irrigados de California; y del Llano Estancado de Tejas; ombres que podemos Ilamar, del suelo, labradores; sin embargo, estos aqui han escogido el terreno al parecer con ojos cerrados A las claras sefiales de la Naturaleza. Hombres que fueron criados entre los playazos salitrosos de la costa del Atlintico; entre las rocas de la Nueva Inglaterra; en las calidas y dridas sabanas del Oeste; entre los higos chumbos del Suroeste; 6 entre los lagos y pantanos de la Florida, legan aqui y adquieren, pagando en efectivo yd alto precio, terrenos cual ellos han conocido toda su vida como de los mas pobres y s6lo litiles a quienes estin acostumbrados 6. una mala y pobre vida. Tales terrenos ellos los adquieren y alli viven durante afios y realmente es para ellos tan poco interesante, que no pueden decirnos mis alla de cuatro 6 cinco de los nombres y usos de los cientos de clases de maderas que en sus propiedades crecen. Ellos no procuran saber con la naturaleza el uso de su didiva. Cada variedad de arbol es diferente a los otros, cada cual se posesiona del terreno y crece, pero cada cual de manera distinta y cada uno tiene sus peculiares usos y propiedades. Hay Arboles de madera blanca, los hay de madera dura, hay bosques que crecen alterosos y otros bajetones. Si con cuidado examinamos ambos de estos aspectos forestales, ellos mismos nos dirin el valor de la tierra. Los Arboles de coraz6n son correlativos de determinado suelo, y los de madera blanca de otros, ambas clases las hallaremos en el bosque alteroso y en el bosque bajet6n; despues de observado, hazte tu mismo la pregunta 1,cudl de estos terrenos contiene mayor cantidad y mejor calidad de alimento para las plantas? excelentes palos de horc6n del centro y Oriente de Cuba; ambos los hallaremos creciendo tanto en bueno como en mal terreno, pero el Jiqui en tierras altas 6 secas, el Cagueiran lo contrario. La Guisuma y Guasumilia, la primera crece en terreno seco, lo contrario hace su prima la guasumilla. El tan comfin Guamd de nuestros potreros nos indica tambi6n humedad. El Caimiti1lo nos dice lo propio y adems que la tierra es Acida. El Cedro indica tierra rica, la Caoba tierra mis pobre y el Jicaro suelo anegadizo. En la gran familia de las Palmas, tan visibles con su acompafiamiento de bella perspectiva de cielo azul, la Palma Real es la mis notable; ademas tenemos el Guano espinoso, la Yuraguana, Manaca, Guano de Cana, Yarey y otros; la primera indica buen terreno, la siguiente'tierra seca, la que le sigue rocas, la siguiente canto de arroyo, la siguiente tierra baja y la iltima terreno medio. Pasemos ahora 6 las plantas que conocemos porque nos han causado dafio; el Guao, Palobronco, Picapici y Ortiga; los dos primeros son de tierras malas, los segundos de tierra buena; el Guao de Costa tambien malfico es de tierra pobre y 6cida; el Manzanillo de tierra baja; el Chichicate 6 Pringamozo lo hallamos creciendo en terrenos de los mejores. Entre los 6rboles algo mins conocidos la Macagua indica terreno rico y de fondo, la Majagua tierra himeda, el Dagame tierra media, la Llana playazos, el Mangle terreno salitroso y el Peralejo tierra seca. transporte en Cuba se hallan en pequefias porciones en las orillas de los rios (*). Los terrenos de iguales colores de los Estados Unidos situados al Oeste hasta Kansas y al Noroeste hasta Montana, son producidos por acci6n glacial, 6 s6ase productos del hielo en movimiento y formadas en epocas prehist6ricas; los del Gran Charco (Nevada) fueron depositados por aguas mansas (lacustrinas); una parte de los profundos y ricos suelos de los valles y Ilanos de las Rocallosas y de las costas del Pacifico y del Atl6ntico son de Aluvion (transporte por agua en movimiento); Coluviales, (producidos por desintegraci6n de las lomas) 6 de Loess (**) (formadas por vientos). Tales se encuentran en los estados de Colorado, Wyoming, Montana, Washington, Oreg6n, California, Dakota del Sur, Nuevo Mejico, las Carolinas; Georgia, Alabama, Missisippi, Luissiana, Florida y Tejas. Consideradas como tales terrenos de transporte, sus condiciones fisicas y propiedades quimicas tienen que ser diferentes 6 los de os propios colores en Cuba. Los terrenos de las montafias Apalaches y Meseta del Piamonte; los del distrito calizo de Kentucky, Tennesse y Missouri; los Llanos de Kansas, Oklahoma y Tejas pueden considerarse mis parecidas a las tierras de Cuba en raz6n de su formaci6n residual, 6 pesar de que es natural que diferencias de clima han de dar 6 cada cual propiedades no comunes a todas, como tambi6n resultard por la clase de roca de que provienen. (*) Palabra alemana sin traducci6n. arcillosos son propensos a ser hdmedos; los arenosos d ser secos; asi es que el terreno medio, el Arcillo-Arenoso 6 Areno-Arcilloso puede considerarse como el terreno ideal para el labrador. Up to the present time there has been very little printed on the subject of citrus fruit growing in the tropics; not that the tropics are not adapted to the cheap production of all classes of oranges, leffions, limes, grapefruit, etc. superior to any fruit grown outside, or above the frost line of any country. The power that has made both California and Florida citrus fruit countries is the indomitable will of the Anglo-Saxon who lives there and has decided to grow these crops. When the weather becomes too cold he gets out his oil pots, pitch pine wood, resin or other combustibles, and at once proceeds to change the temperature in his grove for the few hours, or days, as the case may be until the weather becomes warmer. When the weather is dry and the crops begin to suffer he turns on water from his irrigation ditch, or well, and creates moisture needed to mature his fruit properly, 'instead of allowing Nature to do everything just as she whims, watering in her own season and feeding the billions of scale insects on his trees. not shown the energy and business care that are demanded today to make, one successful. However, he is following very closely the strenuous brother, and many times showing him a few things. There is no doubt that a reciprocity of ideas between the Latin and Saxon is beneficial to both. The first qualities that a fruit grower should possess are plenty of energy, and care of detail, which mean close attention and application. In Cuba there are generally good soils for citrus growing; in the older settled provinces are manyye ars ago, and in each instance you will find that the trees are planted too close, usually from eight to ten feet apart, whereas a they should be ighteen to twenty feet apart. The seedling is not at all desirable for planting for the reason that one cannot tell what it will bear, and it is frequently of a very poor quality, but too good, perhaps, to cut down and throw out. The budded tres run all the same as to flavor, size, time of bearing, etc., and do not grow so high that the fruit must be picked with a pole; nothing but a ladder should be used in the gathering of the fruit, and it should be clipped so as not to break and split the branches, which pulling off will do. There is only one way to succeed in growing citrus fruits in the tropics, and that is to never attempt to g row your own trees unless you are proficient in budding, and can afford to wait two to three years; also you must know on what particular root this, or that variety does best on a certain soil. Go to your nurseryman, and procure the best trees he has for sale, and he will tell you when, and how to plant. prune, and care for them. If there should be no handy nursery enquiries can be made and the most reliable one selected for your purpose. the y should be watered when the leaves show signs of curl, and done so copiously a little water will not help matters* Make a basin round each tree by raking up the dir, and wet the ground down for several feet using five to ten gallons of water. Usually, after the first year the trees will not need this care. When trees are first planted and begin to branch there is a great desire to commence pruning them, but this should not be done; let everything above the bud grow for, at least, one year, when you can begin to thin out, and shape your trees. The second year they will nearly all bloom, and try to bear fruit, but this you should not permit by picking off all fruit as soon as it can be seen. Grow your trees two to three years and then let them bear, but be careful not to allow them to over-bear for the size of thc trees; it is advisable to prop all the lower branches, as well as pick off all the badly shaped, and marked fruit. Spraying. All trees should be sprayed with a good insecticide to kill all scale once a year, and. for some of the trees twice is necessary. If these few simple instructions are followed you will have plenty of fruit to eat, sell and give to your friends. There is no better food for the child than the orange, and for the grown up it is a commercial tonic. and a heavy producer which sells for 75 cents to $1.00 per hundred. If any points are not entirely clear to the reader I shall be glad to reply to enquiries. Hasta el presente poco se ha publicado en cuanto A la siembra y cultivo de frutas citricas en paises tropicales; no es esto debido 6A que los paises tropicales no sean adaptados 6A la producci6n econ6mica de toda clase de naranjas, limones, limas, toronjas, etc. de superiores cualidades 6A toda fruta similar producida al norte de la linea de las heladas s6ase el pais el que fuere. El poder que ha hecho, tanto 6A la California como A la Florida lugares de producci6n citrica es ia indomable voluntad del Anglo-Saj6n que viviendo en aquellos lugares se ha empefiado en producir tal cosecha. Cuando la temperatura baja, cuando es excesivo el frio el se prepara con sus estufas de petr6leo, lefia de pino tea, rea rubia i otras materias combustibles y con lo mismo procede 6 cambiar al ambiente del lugar de su huerta durante unas horas 6 dias hasta tanto mejoran las condiciones da temperatura; cuando el tiempo se presenta seco y las cosechas principian a sufrir les aplica agua tomindola del pozo 6 de su toma de irrigaci6n y crea de esta manera la humedad necesaria A la maduraci6n conveniente de su fruta en vez de permitir que la naturaleza lo haga todo asi como a ella le plazca, regando en su propia epoca y dandole de comer A los millones de insectos par6sitos que 6 expensas de las plantas viven. carifioso, siempre dispuesto 6 recibir al extrafo cual amigo, hospitalarlo hasta donde le alcanzan sus medios para hacerlo, amigo de dar consejos y recibir con placer as ideas de otros hombres, pero le falta curiosidad en el trabajo, no atiende 6 los DETALLES de su negocio dejando de ello m6s de la cuenta en manos de otros en lugar de atenderlos personalmente. Todo su ser y su vida futura se presentan por la linea de menos resistencia; hasta la fecha no ha demostrado la energia y el cuidado econ6mico que son hoy necesarios para prosperar, sin embargo va siguiendo la linea trazada por sus hermanos mas activos, mis batalladores y en muchas ocasiones 6 istos ensefia cosas fitiles. No hay duda que una buena reciprocidad de ideas entre el latino y el saj6n es beneficioso 6 ambos. La primera cualidad que ha de poseer el cultivador es energia en abundancia y cuidado de detalles, lo que significa cuidadosa atenci6n y aplicaci6n. esta i61tima que f6cilmente determina la rotura de las ramas de los arboles. Un solo m6todo existe que d6 resultados en cuanto al cultivo de arboles frutales citricos, y este es el nunca proponerse producir sus propios arboles a no ser que sE es inteligente conocedor del ingerto; y al propio tiempo se est6 en condiciones economicas para aguardar la producci6n durante dos 6 tres afios; adem6s se ha de saer sobre cual clase de raiz 6 patr6n da mejor resultado tal 6 cual variedad, dado la clase de terreno en que ha de sembrarse. Procurese un criador de plantas y procure las mejores que l61 tenga a la venta,y 61el te dir6 co-. mo y cuando se han de sembrar, como podarlas y come cuidarlas; si en sus cercanias no existe uno de 6stos, f6cilmente puede inquirirse en cuanto 6 ellos y escoger e de mejor reputaci6n. Con 6rboles sembrados en tierra bien arada, no ha de permitirse que '6stos se enyerben como tampoco dE ellos amarrar animales y permitir que se rasquen en ellos; el primer afio se debe de remojarlos tan pronto las hojas empiecen 6 encresparse, y remojarlos blien, un poco de agua no producird beneficio alguno; f6rmese alrededor de cada 6rbol una como batea, form6ndose 6sta con la misma tierra y rem6jese esta tierra de modo quE el agua penetre varios pies hacia abajo, us6ndose para el caso de 5 6 10 galones de agua por mata; generalmente despu6s del primer afio los 6rboles no necesitar6n de esta atenci6on. pero esto no debe de permitirse y para ello se ha de quitar en seguida toda fruta que se presente. Dbjese 6 los 6rboles durante tres afios y entonces puede permitirseles que produzcan frutas, pero teniendo cuidado de evitar una super producci6n incompatible con el tamafio del 6rbol; es conveniente soportar con horquetas todas las ramas inferiores como tambidn quitar toda fruta de mala figura y las dafiadas. Aplicaci6n de insecticidas. -Todo 6rbol debe recibir aplicaciones de un buen liquido insecticida por lo menos una vez al afio para destruir los insectos par6sitos, y para algunos de los 6arboles ser6 necesario hacer esta operaci6n por lo menos dos veces al afio. Si estas pocas y simples indicaciones se siguen, se obtendr6 bastante fruta para comer, vender y regalar 6 los amigos. Existen hoy tantas variedades de estos Arboles que se puede tener frutas durante toda 6poca del afio sembrando para el caso unas pocas de cada variedad. No hay mejor alimento para los nifios que la naranja, y para el adulto es un t6nico. Desde el punto de vista econ6mico ya sabemos como ha de cultivarse la planta; vamos 6 ver ahora qu6 puede producir estando en buenas condiciones. Las Tanjerinas, Mandarinas y variedad King son altamente prolificas y produciran de 300 d 500 frutas al tercer aflo las que valen de $0.75 a $1.00 el ciento en el mercado local. La Navicular es una naranja grande, dulce, sin semilla y muy solicitada; los 6rboles de esta variedad producen tanto como las tanjerinas pero la fruta es de mayor tamafio y se vende de $1.50 6 $2.00 el ciento. Hay ademas la naranja pifia 6 China, dulce y buen productor que se -ende de $0.75 6 $1.00 el ciento. Sobre puntos que no halle bien claro el lector, tendre sumo gusto de contestar sus preguntas. If it were possible to substitute the English for the Spanish language it would always be essentially important to retain a knowledge of the latter. Quod abundat non nocet; but as it is a anthropological law unequal as they may be in power, the native language always continues in use, and it is clear that the knowledge of the Spanish language is not only of great importance but of vital necessity to the colonist. In this we have a good example in the Argentine Republic, in which country the Spanish language easily predominates in spite of the extraordinary immigration of foreigners. The Germans have not succeeded in killing the Polish language, and in Spain, notwithstanding the political and religious unity, such important dialects exist as the Catalonian, and Gallician, and even a lp ngauge the Basque. The colonist cannot be happy in, nor love his adopted country without knowing its language, but with this knowledge he will be able to expand to his environments, be just, and considerate, and his mind will open to the real state of things as they are in SPANISH, and not in English. says "In many cases the nature of our governments, and our civil institutions requires an a propiate language in the definition of words even wRen the words express the same thing as in England. Thus, the English dictionaries inform us that a justice is one deputed by the King to do right by way of judgment." If space permitted it could be demonstrated that the Americans and Cubans have quite distinct opinions on some judicial questions, as for instance, the censos and equity, although the conception of autonomy, liberty, and independence differ in detail in the two minds, nevertheless, in feeling and conduct they are quite the same. The Spanish language will reveal to the colonist a great treasure of agrarian knowledge. He will be enchanted with the wisdom of the Spanish agriculturists from Columela to Jovellanos; and even localizing will find in the writings of Saco, Rodriguez Ferrer, Arozarena, and a hundred others a wide field where he may roam at will and with much profit. It is an economic reserve, and a saving of time and considerable money. The colonist who possesses this acquirement is worth ninetyfive per cent more than he who does not. I consider this study to be of the greatest importance, and would add that if the Cuban finds it difficult to perfect himself in foreign languages, the Spanish language on account of its logic, richness, and great simplicity is the easiest for others to acquire. With reference to the Anglo-Saxon the most useful language for him to study is undobtedly Spanish. French may be useful to the artisan; German to the technologist, but for each American artisan and technologist there are a hundred thousand who require bread for themselves and families, and this is attained with greater ease in Spanish America than in any other part of the world. Si fuese posible sustituir en Cuba el idioma castellano por el ingles, siempre seria importante el conocimiento del primero. Quot abundat non nocet; pero como es ley anfitropol6gica que en el contacto de dos razas potr desiguales que sean en potencia, siempre persiste el idioma nativo, es claro que el conocimiento del castellano ya no es de importancia, sino de absoluta necesidad para el colonizador. Tenemos de esto un ejemplo en la Repiblica Argentina, en cuyo pais persiste el castellano a pesar de la extraordinaria emigraci6n de extranjeros. Los alemanes no han podido concluir con el polaco; y en la misma Espafia, no obstante la unidad politica y religiosa, subsisten dialectos tan importantes como el catalAn y el gallego y hasta un idioma: el vascuence. El colonizador no podrd estar alegre, ni amar el pais de adopci6n, sin conocer su lengua; y, en cambio, el conocimiento le haria ser justo y ponderado, y ver las cosas como son en castellano y no en ingles. lenguage in the definition of words, even when the words express the same thing as in England. Thus the English dictionaries inform us that a justice is one deputed by the King to do right by way of judgment. Si tuviese espacio demostraria que los americanos y los cubanos tienen conceptos distintos de algunas instituciones juridicas, como por ejemplo los censos y la equidad; 6 bien que los conceptos autonomia, independencia, libertad difieren de una mentalidad a otra, aun en igualdad de sentimientos y de conducta. Por otra parte, el conocimiento del idioma castellanorevelaria 6 los colonizadores extranjeros un tesoro en las disciplinas agrarias. Quedarian encantados de la sabiduria de los geop6nicos espatioles desde Columela hasta Jovellanos; y adn, localizando, hallarian en los. escritos de Saco, Rodriguez Ferrer, el Dr. Villal6n, el Conde de Pozos Dulces, Reynoso, Arozarena y cien mas, ancho campo donde espigar. Econ6micamente el conocimiento del castellano equlvaldria 6 una reserva econ6mica, 6a un ahorro de tiempo y dinero considerable. En igualdad de casos, el colonizador que cuente en su activo con el idioma, es 95 por 100 mis rico que el ignorante. Por todo ello pienso que es muy importante el cono-cimiento del castellano, y afiado que si 6a un cubano le es dificil la adquisici6n de los idiomas extranjeros, el castellano, por su simplicidad, su 16gica y su riqueza es de suma facilidad para los otros hombres. Con referencia 6 los americanos dir6 que el idioma m6s titil para el hombre americano es el castellano..
El francis puede ser itil al artista, el alem6n al ticnico; pero por cada artista, por cada t6cnico americano. existen cien mil que lo que necesitan es buscar los frijoles para comer, y estos se encuentran mejor en la America hispana que en ninguna otra parte..
Labor! The most important question before all the nations at the present time. For the colonist in Cuba it is a most intricate problem until he has discovered the solution. Some find it within their first years stay while others never seem to grasp the key, due undoubtedly to the temperamental qualities of the individual. He must employ native labor but how to organize and administrate it to obtain maximun results is the question. The farm laborer is the same the world over a hard worker, and tractable to considerate treatment, and the Cuban farm hand is no exception to this rule. Deprived 4 the great key to all knowledge, education, by adverse circumtances of the development of his country, his oportunities for self development have been practically nil, and we who employ him should bear in mind that he is a grown man and worthy of considerate treatment. Bear this in mind you grove owners and you will have a valuable asset in your business! Obviously the first essential is a good working knowledge of the Spanish language. The second that this knowledge be combined with with tact; one without the other produces questionable results, but in combination they spell success to the grower. rer too much of this most excellent quality cannot be too abundant in your business. Treat him simply, and squarely*, and he becomes your faithful servant, even unto his family, friends, acquaintances, and family pets. Pay him regularly and in coin and NEVER through the class of store that compels him to take merchandise in part payment. This is one of the chief causes of discontent among the Cuban laborers, because it deprives him of the liberty of having power over his own earnings. It is a common practice and always gives bad results. If things sometines go wrong do not get into a blinding rage and shame a grown man in the presence of his companions. Such treatment will make him an obstinate worker, and you as a business man and ever looking to the future cannot afford any such set-back methods. You want harmony in your business and every sacrifice should be made to obtain and keep it. Reprimanding him in a foreign tongue is unbusinesslike as it makes him mistrust you, and will work to your detriment. Let him understand that you are the only boss on the place and see that your orers are obeyed to the letter, but you can be diplomatic about it and he will respect you. Once having gained his respect and faith be sure to keep worthy of it by careful treatment, and your troubles will be diminished one hundred per cent. Cain his confidence by square dealing and teach him to have absolute confidence in your word and not only will he be a good worker but will defend you property and interests at all times. If, however, you find you really cannot manage your labor your only remedy is to employ a good foreman and deal direct with him-anyhow, get results. You will bear in mind that too many feast days will spoil the best of workers! close companion throughout the year, and their partial and superficial progress is only attained by such mental perturbation that life itself is unpleasant, difficult and sombrous-and in a country of perpetual sunshine, and blue skies, too! The colonist is compelled to employ the native labor and the sooner he understands its idiosyncracies and forgets that this climate does not admit of the nervous impatient rush of the northern commercial centres the sooner will he find his life all smiles, and health and business successful. The succesfull grower finds his business ever expanding; ever progressing. This benign climate enters his very soul, and Dame Fortune beckons him onward to comfort and the happy annual family trip to the homeland because he practises the combination of-language and tact. El trabajo! He aqui la cuestion mi s importante planteada para todas las naciones en la 6poca presente. Para el colono cubano es problema dificil hasta que descubra la soluci6n. Algunos encuentran esa soluci6n pronto, mientras que otros nunca parecen encontrar la clave, debido indudablemente al temperamento de cada individuo. Todo colono quiere utilizar al trabajador cubano, pero la gran cuesti6n es como lo administra y lo organiza para obtener el mAximo de resultados. El trabajador de campo es en todas partes lo mismo: un trabajador resistente y manejable bajo un trato considerado, no siendo en este punto una excepci6n el trabajador cubano de la gran Rave de todo conocimiento, que es la educaci6n; por circunstancias adversas al desenvolvimiento de su pais, sus oportunidades para el propio desenvolvimiento han sido practicamente ningunas, y es esta una cosa qtue debemos tener presente cuando le empleamos, recordando que es un hombre hecho y que merece buen trato. Ustedes, duefios de planteles, tengan esto presente y verin cuin valioso activo tendran que anotar en la contabilidad de sus negocios! Es obvio que lo esencial es un conocimiento suficiente y aplicable del idioma espafiol. Lo segundo es que este conocimiento se convine con el tacto, puesto que lo primero sin lo segundo produce efectos discutibles pero en combinaci6n siempre resulta un beneficio para el agricultor. Cuando le coloque, asegurese de que el hombre sepa simplemente y de una manera clara qu& es lo que tiene que desempefiar; si es necesario, repitale sus 6rdenes una y otra vez, con despacio, con paciencia. La paciencia es una gran virtud y al tratar con el trabajador extranjero la paciencia nunca est6 demis. Tritele con sencillez y con honradez y se convertir6d en in fiel defensor que le defender6d en donde quiera que se halle. Pdguele con regularidad y en met6lico y NUNCA por medio de un establecimiento en donde esta obligado 6 gastar parte de lo que gana. Esta es una de las causas mis grandes de descontento entre los trabajadores cubanos, porque les priva de la facultad de disponer libremente de lo que gana. Es una pr6ctica corriente que siempre da malos resultados. Si las cosas alguna vez van mal, no se arrebate de c6lera y avergfience 6 un hombre delante de sus companeros, porque eso le convertir6 en un trabajador testarudo y el hombre de negocios que ha de mirar siempre al futuro, no puede sostener esos elementos que son negativos. Lo que se quiere es armonia en el negocio, y ningin sacrificio debe omitirse para obtenerla. sea hdbil intermediario entre el duefio y los trabajadores. iRecu6rdese que demasiados dias de fiesta echan d perder d los mejores trabajadores! Muchos de los colonos extranjeros son buenos estudiantes de espafiol, pero carecen de habilidad para aplicar sus conocimientos. Rehusan ser flexibles 6 tolerantes, no obstante ser para ellos una conveniencia el procedimiento, con el inevitable resultado de aumentar sus dificultades y hacerle concebir una idea triste de la vida, que entonces aparece dificil, desagradable y sombria, en chocante contraste con la Naturaleza en un pais de sol perpetuo y de eterno cielo azul. El colono estd obligado 6 emplear trabajadores cubanosy mientras mis pronto entienda su idiosincracia y olvide que este pais- no admite la nerviosa impaciencia de los grandes centros comerciales del Norte, mas pronto encontrara que la vida sonrie, que hay salud y que los negocios son un 6xito. El agricultor que ha acertado encuentra que su negocio siempre se expande y siempre crece. Este clima benigno le habla al alma y la sefiora Fortuna le impulsa y le leva a su viaje feliz anual con la familia a la madre patria, porque practica la gran combinaci6n: el lenguaje y el tacto. The existence of the pig lice, Haematopinus suis, seriously impedes the development of the pigs, particularly the younger ones, and we should do all possible to prevent this pest from annihilating our stock as it does at the present time. With this object in view we can recommend to the breeders of Cuba that they take the greatest precautions against this parasitic plague which, "although generally ignored in this country is none the less disastrous to the animals. Generally speaking the corrals and styes are much neglected, nobody apparently wishing to recognise the erroneus idea that pigs require to live in very unhygienic surroundings, whereas this is the most favorable condition for the cause, and propagation of the numerous plagues that yearly attack the animals to the great detriment of the breeder. Special care should be taken to frequently desinfect the corrals and styes, and it is natural that once this custom is established on a farm devoted to pig raising, the results will be appreciably noted by the avoidance of the epidemics, and the consequent betterment of health, increase and quality of stock. very efficacions to thoroughly disinfect the corrals, places where the pigs wallow, sleeping places, and other spots most frequented by them, the adoption of which system will give splendid results, but if ignored will contribute considerably to the development of numerous epidemics and inevitable loss. Creoline, and other analagous preparations, Zenoleum, "Kreso Dip" of Parke Davis, and others with a basis of tar, can be favorably employed in the destruction of the most common parasites such as the common pig lice. We have had very good results in the destruction of these lice by bathing the animals in a solution of ten per cent of Creoline, or Zenoleum, and it can be used at small cost. Another bath that can be well recommended is a solution of eight parts of crude petroleum to one hundred parts of water. It is also a very good practice to frequently put a little creoline, or petroleum in the pools of water, or wallow places, and it should not be forgotten that clean corrals and styes will mean the complete elimination of these plagues. -or when they are growing, and when this pest most frequently occurs, is a most serious drawback health,. and proper development of the pigs. They are not so common in pigs that are given proper care, but it has been observed that nothing will conduce so much to the spreading of this parasite as the insanitary.condition of the corrals and styes. The animal is often found to. have intestinal worms, the most common of which are the Acarias Suilla, and Eehinorhyncus Gigas, both living in the smaller intestine, the latter adhering to its walls by means of strong head hooks from which it derives its English name of "'Thorn-headed worm." The giving of medicine to pigs is extremely difficult; so much better results are obtained by mixing it with some food they are particulary fond of, such as whey, surplus foods from the kitchen, or milk. In the treatment of this sickness it has been observed that Santonina, and Nuez de Areca, althongh somewhat costly, have given fine results. The Nuez de Areca should be administered in the quantity of three centigrams to each two pounds in weight of the animal; it is an irritant and will act as a purgative. The Santonina can be used with great ease, and we recommend the following method to the breeder. Make a paste of cooked sweet potatoes, or malanga, and mix the Santonina with it, then make small balls of this to give to each pig,-the dose may be from six to twenty centigrams according to the size, and age of the animal; they will eat these balls without trouble and good results will be obtained. Turpentine has always been a very popular remedy for the destruction of worms in pigs, but we consider Santonina to be more efficacious. The Bureau of Animal Industry of the United States recommends a formula of tonic powders for the prevention of the disastrous effects of pig cholera, or Pintadilla. This was well received by breeders in that country, and we have tried it with such good results here in Cuba that we here with give the formula that its application may be made in %this country by the breeders. These ingredients should be well pulverized and mixed, and a tablespoonful be given for every two hundred pounds of weight of the animal, but if the pigs are smaller the dose should be reduced correspondingly. It often occurs that after being castrated tumors will from in the testicle cords as a result of infecction by the use of dirty knives, also due to the little care usually given after the operation. It is sometimes, due too,to the cutting of the testacle cords too near the testacles themselves leaving the cord too long, and augmenting the probability of infection of the cut extreme end. In these cases another operation is necesary, the procedure of which should be as follows; pull out the testacle cord to its fullest length, and cut it as high as possible, including all the infected parts, then heal the wound by means of daily washings of agua fenicada or a solution of five per cent of Creoline. Por el Dr. Emilio L. Luaces, M6dico Veterinario, Jefe del Departamento de Zootecnia. El piojo del cerdo, Haematopinus suis, ocasiona grandes trastornos en la cria de cerdos y particularmente en los cerdos pequefios, la existencia de esta plaga ocasiona un retraso perjudicial en el desarrollo de esas crias; consideramos necesario evitar en lo posible las infestaciones de las crias de cerdos con estas plagas que aniquilan notablemente 6 los animales, causando con ello perdidas de consideraci6n d los criadores. Con este fin recomendamos a los criadores de cerdos en nuestro pals, que traten de tener sumo cuidado en cuanto se relaciona a la existencia de esas plagas parasitarias que aunque desatendidas en nuestro pals, no por eso dejan de ser mds desastrosas. Los corrales y chiqueros, por regla general, se encuentran muy abandonados, nadie quiere reconocer que la err6nea costumbre de considerar que el cerdo necesita imprescindiblemente vivir en lugares faltos de limpieza, es acaso la causa mis favorable al desarrollo de numerosas enfermedados que atacan anualmente las crias de cerdos, con serios perjuicios al criador. Debe tenerse especial cuidado en desinfectar con frecuencia los corrales, chiqueros y revolcaderos de los cerdos; dard muy buenos resultados y asi se evitarA el desarrollo de epidemias en las crias de cerdos. lidad de desinfectar todo el terreno en donde se crian cerdos, pues sabemos que con el sistema de crianza que se usa en nuestro pais, no seria pr6ctico desinfectar los potreros, pero en cambio resulta sencillo y a la vez muy conveniente, el sistema de desinfecci6n de los corrales, revolcaderos, dormitorios y otros lugares que frecuentan los cerdos, de cuyo sistema, obtendrian los criadores resultados positivos, si se acostumbraran 6 considerar estos puntos, que abandonados por completo, contribuyen al desarrollo de numerosas enfermedades. La creolina y otros preparados andlogos, el "zenoleum", el ilamado "kreso dip" de Parke Davis y otras muchas substancias 6 base de alquitrin se pueden emplear favorablemente en la destrucci6n de los parisitos mis comunes de los cerdos, como son los piojos corrientes en la cria de ganado de cerda. Acostumbramos 6A bafiar los cerdos con una soluci6n de creolina 6 de zenoleum mezclados estos preparados con agua al diez por ciento y ese bafio que puede usarse econ6micamente, resulta muy provechoso en la destrucci6n de los piojos. Tambi6n se recomienda favorablemente el empleo del petr61eo crudo, ocho partes del petr61eo en cien partes de agua, para emplear dicha soluci6n en el baf o de los cerdos. Asimismo resulta una buena prdctica la de echar con frecuencia un poco de creolina 6 petr6leo en los charcos 6 revolcaderos dcte los cerdos y tambi6n no debe.olividarse que la limpieza de los corrales y chiqueros contribuird 6 la destrucci6n de esas plagas. do que nada contribuird tanto al desarrollo de esas plagas de pardsitos como la falta de limpieza en los corrales y chiqueros. Se encuentra frecuentemente en el cerdo la existencia de lombrices intestinales, siendo de ellas las mis corrientes, las variedades siguientes: "Ascaris suilla" y la "Echinorhyncus gigas" viviendo ambas en el intestino delgado y adhiri6ndose la variedad "gigas" d las paredes del intestino por medio de fuertes ganchos que tiene en la extremidad cefdlica de donde recibe el nombre ingl6s de "Thorn-headed worm." La administraci6n de medicamentos al ganado de cerda resulta en extremo dificil, por eso es necesario mezclarles los medicamentos, con alguna substancia que ellos coman bien, como el suero sobrante de las queserias, las viandas cocinadas 6 la leche: en el tratamiento de las lombrices de los cerdos se emplea con muy buenos resultados, aunque algo costosa, la "Santonina" y tambi6n la "Nuez de areca." La nuez de areca se empleard en la cantidad de tres centigramos por cada dos libras de peso del cerdo ;la acci6n de la nuez de areca, siendo irritante, serd por tanto la de un purgativo cuando se le administre d los cerdos. Scada animal del bolo que contendrd la dosis correspondiente d cada cerdo. La .trementina ha sido siempre un remedio muy popular para la destrucci6n de las lombrices de los cerdos pero creemos mis eficaz el empleo de la "santonina." Se ha recomendado por el ((Bureau de Industria Animal) de los Estados Unidos, una f6rmula de polvos t6nicos, para emplearla en la cria de cerdos, la cual tuvo mucha aceptac16n entre los criadores de cerdos de aquel pais, cuya f6rmula era especialmente recomendada para prevenir los desastrosos efectos del ((C61era de los cerdos) 6 ((Pintadilla) y como quiera que esa mismapreparaci6n, hemos tenido ocasi6n de emplearla como un t6nico en los cerdos con buenos resultados, la transcribimos en este trabajo, con la idea de que su empleo pueda ser favorable 6 los criadores de cerdos en nuestro pais. SLos anteriores ingredientes se mezclarin y pulverizaran muy bien y la dosis de esta preparaci6n sera de una cucharada grande por cada doscientas libras de peso del cerdo una vez al dia 6 de ser cerdos mis pequefios se reducird convenientemente la anterior dosis. trado un cerdo, la presencia de tumores que se forman en las cuerdas testiculares como resultado de infecciones que tienen lugar cuando se emplean cuchillas sucias y tambien debido a la poca limpieza que se tiene casi siempre cuando se castran los cerdos 6 tambidn puede dar lugar 6 la formaci6n de estos tumores el seccionar las cuerdas testiculares muy pr6ximas 6 los testiculos dejando la cuerda muy larga despu6s de cortada lo cual aumentara la probabilidad de una infecci6n del extremo seecionado. En estos casos se hace necesaria una nueva operaci6n, debiendo para ello proceder cual si fuera 6 realizar de nuevo la secci6n del cord6n testicular, el cual se extraerd hacia afuera y se hard una secci6n de dicho cord6n 1o mis alta posible, es decir, una vez que haya sido extraido el cord6n testicular, se proceder, seecionarlo en su parte mis alta, cortando asi toda infecci6n y obteniendo en cambio la cicatrizaci6n completa la que se auxiliary por medio de lavados antis6pticos de agua fenicada 6 de una soluci6n de creolina al einco por ciento con la cual se lavaran las partes operadas diariamente. Caution is a grand thing if heeded: one of our greatest troubles is to heed, good advice, and benefit, ourselves. I If there are any errors in the grove-making category that I have not had to experience I do not know them. I am not for a moment in favor of not allowing well grown three and four year old trees to mature some fruit, but to allow them to load up with twice, and three times their capacity is plain murder to them, and poverty for you. What then is a load of fruit for a well grown four year old tree? On some soils such a tree is only half the size of a tree grown on rich virgin soil of another locality. Here our trees at four years are ten to twelve feet high, and have a spread of twelve to fifteen feet. Such trees can bear one, to one and a half boxes of fruit without the least damage being done to the tree, and each fruit can be fancy in shape, and color. To do this it requires lots of nerve to pull, and pull off the young fruit, because we need the mo-. ney, but it is wise to cull them at least three times during the season. When the fruit is the size of an egg cull it carefully, pulling off everything that is poorly shaped; you will know that most young trees bear a crop of sheep-nosed fruit. Sixty days after the first culling the trees should be gone over again, as you will have missed a great many on the first journey, so get them off. If special care is used on this second trip, the third journey can.be dispensed with. will attain a larger size, and make more boxes per hundred fruit than if all were left on the tree; you also preserve the vitality of the tree for the coming crop. Cull the fruit while on the tree, and not in the packing house, and your output will be fancy fruit, and high prices are always awaiting this high grade fruit. The saving of the vitality of the tree will produce a larger, and healthier growth besides the fancy fruit; and it will require, at the very least, a year for the tree to recover if allowed to overbear. You can ill afford any such calamities to happen to you, so pull off the fruit and produce only fancy stuff for the fancy market. There will be many who will doubt the wisdom of these few words, but I can assure them-that a little careful attention to this important subject will be the means of saving them many hard thoughts against Nature, and perhaps, even decide the question of success and failure. Un buen consejo es una gran cosa cuando se tiene en cuenta; uno de nuestros mejores trabajos es el tener en cuenta los buenos consejos y aprovecharnos de ellos. Si existe algin error, de los muchos que se pueden cometer en la plantaci6n de arboles frutales y que yo no he experimentado, no lo conozco. No soy partidario en manera alguna del sistema de no permitir la producci6n de frutas en Arboles vigorosos de cuatro aiios y hasta de menos edad,per.o el permitir en tales drboles una producci6n de tres y cuatro veces la cantidad de frutas que deben de tener es simplemente asesinar el drbol y por lo tanto perdida segura y material para el cosechero. LEn qu6 consiste pues una buena producci6n para un arbol fuerte y robusto de cuatro afios de edad? En algunos terrenos tal arbol s6lo seria de la mitad del tamafo que otro creciendo en terreno rico, virgen en otra localidad. Aqui (en Mayabe) de cuatro aflos de edad tienen de 10 a 12 pies de altura y de 12 a 15 pies de didmetro de ramaje. Tales drboles podrdn producir y madurar de una una y media caja de frutas sin que tal cosecha produzca dafio alguno al Arbol y todas y cada una de las frutas podrdn ser de lo mejor en figura y color. un huevo de gallina es l1egado el momento de verificar la operaci6n de desechar lo malo, y ha de arrancarse toda fruta imperfecta; ya sabemos que la mayor parte de los frutales nuevos producen una cantidad de frutas de figura de cabeza de carnero y tales son initiles. Sesenta dias despubs hemos de verificar por segunda vez la operaci6n, pues en la primera habremos pasado por alto muchas de tales frutas de mala forma. Si procuramos el mayor cuidado en esta segunda operaci6n podemos dispensar con la tercera. Al hacer la operaci6n de escogida no debemos considerar una p6rdida la fruta arrancada nada se pierde, pues la fruta que queda en el arbol llegard d obtener mayor tamaflo y por lo tanto producird mayor nimero de cajas por cientos de frutas determinadas que si todas las dejdramos, y ademis se preserva la vitalidad del Arbol con beneficio positivo para la subsecuente cosecha. Higase el aparte de la fruta inferior mientras atin se halla en el arbol, no dejando esta operaci6n para hacerla luego en el almacn de empaque y tendr.s fruta de clase extra; la que sigue obtiene precios altos. La preservaci6n de la vitalidad del drbol producird mayor y mas robusto crecimiento ademis de la fruta de superior calidad y el drbol d que se le permite un exceso de producci6n necesita por lo menos un aio para recu perar su vigor perdido. Dificilmente se puede soportar tales daiios;asi es que arrdnquese la fruta sin temor y obt6ngase un producto s6lo de clase superior. Muchos habr6 que dudar6n del valor de estas pocas palabras, pero yo les puedo asegurar que un poco de atenci6n y cuidado en cuanto a tan importante asunto les evitarA muchas malas ideas en cianto la naturaleza y hasta pueden significar la diferencia entre p6rdidas y ganancias. The Garden of Eden is presumed to be located in the East: be this as it may, and without disturbing tradition, Cuba is certainly a facsimile with its magnificent climate of perpetual sunshine, blue skies, flowers, fruits and hospitable people; she represents Natures most beautiful effort. Here we have no cold weather to contend with, but we do find extremes, such as too much water at one season of the year, and a great scarcity at another, both of which can be circumvented by proper drainage for the former, and irrigation for the latter. The country is fast becoming deforesd, and the consequent drouths more- and more severe each year, making the problem of irrigation a home word to us all. There are few rivers suitable for irrigation purposes in Cuba, but under every five acre tract of land is an abundance of water which must be tapped by boring, or perhaps, in a few cases by digging. There may not be many flowing wells in Cuba, but the water will come near enough to the surface to be pumped in large quantities. results obtained by the use of this wonderful forked, stick, therefore, I can recommend its use. Then comes the question of pumping this water to the surface in sufficient' uantities,andin the cheapest manner possible, and within the means of the agriculturist. Every man will have his particular fancy for this power, steam; alcahol; gasoline; etc. etc., but personally, I consider the wind-mill not only the cheapest, but quite as effective as any other power for ordinary purposes; I may say that I no not mean the ordinary imported wind-mill. I advocate a wind-mill with a tower twenty, to twentyfive feet high, of hard native woods, with a wheel twenty to thirty feet in diameter, and fans of galvanized sheet iron strongly built. This can be made at home at an approximate cost of material of sixty dollars, and will produce more than sufficient power for irrigation, sawing wood, grinding corn, electric light for the house--and the washing machine to please the wife. During the dry season the prevailing winds in the Oriented appear to be N. NE., and are very strong, and while the climate is simply divine, no water falls for plant life, making the settlers income a point of interrogation. Many grove owners in the Oriente are putting in irrigation plants, and fortune is already smiling on them. In Cuba water will produce every crop out of season, for which the northern markets are hungry, and eager to pay fabulous prices. happy is he who can afford a good plant to bring the rain to his crops when they most require it. For the fruit alone it means fortune, not to mention every conceivable variety of out of season vegetable the northerner is crazy to even pawn his shirt to buy. El Ed6n se presume que esti situado en el Oriente, dej6mosle donde la tradici6n la coloca y digamos que Cuba es ciertamente su facsimil con su magnifico clima de perpetuo sol, cielo azul, flores, frutas y gente hospitalaria: ella representa el mks hermoso esfuerzo realizado por la Naturaleza. Aqui no tenemos estaci6n fria contra que luchar, pero nos encontramos con extremos tales como demasiada agua en una 6poca del aflo y demasiada seca en otra, condiciones 6stas que pueden modificarse, por medio de conveniente drenaje cuando sobre el agua y por medio del regadio cuando falte. Lcs campos e3t n siendo cada vez mks desmontados y en consecuencia las sequoias son cada afio mas severas, haciendo que el problema de regadio sea un tema continuo para todos nosotros. Hay pocos rios en Cuba que puedan prestarse para el regadio, pero en cambio bajo cada pedazo de cinco acres puede encontrarse agua en abundancia con perforar el terreno y d veces con s6lo cabar un poco. Puede que no haya muchos pozos que corran en Cuba, pero el agua se encuentra tan cerca de la superficie, que puede ser bombeada f6cilmente y en grandes cantidades. poseen este imomprensible poder metafisico, siendo en unos mis fuerte que en otros. En mi larga experiencia en materia de regadio, he podido ver espl6ndidos resultados obtenidos por el uso de este procedimiento, porlo que lo recomiendo. Despu6s viene el problema de bombear esta agua 6 la superficie en cantidades suficientes y en la forma mis barata posible, dentro de los recursos del agricultor. Cada hombre tendra su opinion particular sore la clase de fuerza que ha de emplear, y unos se inclinarain a usar vapor, mientras otros optar6n por la gasolina, alcohol, etc., etc. Yo considero que el molino de viento no solamente es lo mis barato, sino que es tan eficaz como cualquiera otra fuerza para prop6sitos ordinarios. No quiero referirme con esto 6 los molinos de vientos corrientes importados. Yo abogo por un molino que tenga una torre de maderas duras del pais, de una altura de 20 6a 25 pies con una rueda de 20 6 30 pies de di6dmetro y con aspas de hierro galvanizado fuerte. Esto puede construirse en la casa con un costo en materiales de unos $60.00 y producir6d fuerza m6s que suficiente para el regadio, para aserrar maderas, para moler maiz y ain para luz electrica para la casa 6 la m6quina de lavar para complacer 6 la mujer. Durante la seca los vientos reinantes en Oriente aparecen ser N. N. E. siendo muy fuertes, y mientras el clima es simplemente delicioso, sin embargo la falta de agua constituye su motivo de ansiedad para el agricultor. Muchos duefios de plantaciones en Oriente estin instalando plantas de regadio y las fortuna les sonrie. En Cuba resulta que el agua hard brotar cualquier cosecha fuera de tiempo, que es cuando resultan mejores por estar los mercados americanos ansiosos por recibir los frutos y dispuestos a pagar precios fabulosos. cedimiento popular y parece dar excelentes resultados. Cada tres 6 cuatro afios; segin sea la naturaleza del terreno, se debe dinamitar bien y la superficie debe ser bien removida para evitar la evaporaci6n. La vegetaci6n del terreno dard muestras inmediatas de lo mucho que agradece este tratamiento. Para el buen exito del agricuitor en Cuba, el regadio es como una varita migica, que producira no solo la fruta que es ya una fortuna, sino fuera de tiempo, cuando el habitante del Norte empefiaria hasta la camisa por comprar algunas frutas y vegetales. lFeliz el agricultor que puede hacerse de una buena planta de regadio para darle agua 6 sus siembras cuando ellas lo requieren! All soil originates from the decomposition of rocks mixed with detritus in which are quantities of organic matter. These circumstances together with light, heat,, and sufficient humidity make the condition of the soil sustain plant life, uncultivated or cultivated. Rocks are decomposed by chemical, physical and meteorological action, and by vegetable and animal life, but we can mechanically produce a soil very similar by grinding a few rocks into a fine powder and placing it in an earthenware jar with a perforated bottom and pour on water until it is saturated. It will- be noted that it will not hold the water, but if we take this same powder And mix with a quantity of stable manure, and then. again pour on water it -will be found to retain a considerable quantity. This simple experiment demostrates, that organic substance as a part of the soil augments its absorbing capacity with relation to water, and if we continue the experiment by adding greater quantities of organic matter it will be found that such soil absorbs and retains moisture in proportion to the organic matter it contains. Also we may observe that as this organic matter is increased the powdered rock takes on a grayish color and becomes darker and darker until it is almost black. and if we take samples of the soils to the laboratory and analyse them wes hall see that if they are equal in mineralogical components the physical condition will not be so, that'of the forest will contain organic matter, and that of the sabana little or none. A simple glance shows that the soil from the forest is very dark, and that of the sabana much lighter, and we shall prove they do not produce the same plant life; By taking a handfull of the forest soil and squeezing it will cohere, but not so that of the sabana which contains much less moisture. If we enquire of the chemist who made the analysis what difference he found in the two samples tested he will say that that of the forest contains a considerable quantity of organic matter, which is called humus, and a great quantity of moisture; but that of the sabana was very poor in organic matter, and contained little, or no moisture. If we take a small portion of the soil from the forest and place it in a receptacle and burn it, in a very short time we shall note that it gives off a sort of vapour which is moisture and soon the soil will become darker and darker until it will be found to be actually burning. If we submit the sabana soil to the same process we shall note uhe same phonomenon, but on a much smaller scale proving that it contains a less quantity of humus and water. If we examine parts of sabana land, low, in the shade of trees, or between two trails where is has not been burned we shall find a greater quantity of grass because the conditions are favorable, also there will be found many other classes of grass which do not grow on the open sabana that is subject to burning year after year; and in place of the Zanca de Grullo, Yubana, Espartillo, and other grasses which animals do not eat, is found the Pajilla, El Cafiamazo, La Oveja, etc. etc., all of which give abundant nutrition to the cattle. In many places, where roads traverse the sabanas the rains have collected accumulations of animal manure, etc. and in these places the fire will have had some difficulty in entering, and here will be found a better variety, and distinct classes of grasses than those that grow on the other parts of the sabana. This demonstrates, then, that the greater the organic matter, humus, in the soil, the greater absorption and retention of moisture is noted, and an obviously consequent greater production of grasses, and other plant life. year after year of burning this useful substance the lands are becoming more and morc sterile, diminishing the acreage and quality of pasture lands and consequently the number of cattle with each burning. All plants have a tendency to adapt themselves to their environmental conditions, and in the struggle of the survival of the fittest some succumb, and others live, and it is rarely that we find useful plants living under adverse conditions, such as poor land, scarcity of water, etc. and we have the proof in the vegetation of our sabana lands presenting a light color, pallid, and find only those plants with tough sprouts and leaves, grass without nutriment, and even portions of the land quite denuded of all vegetation. Such plants as Carrasquillo, Espino, Jamagliey, Guao de Sabana, Y uraguana, Palo Bronce, and others similar, indicate by their scarcity of foliage that they have adapted themselves to the soil characteristic of such lands of little retentiveness of moisture. hastened by applying organic manures, planting leguninous crops, or using irrigation, either of which renovating methods will be sufficient to prove that the sabana lands are not so bad in themselves, but are made so by careless, or wilful burning. Todo terreno proviene de las rocas, e intimamente mezclados con tales detritus, se hallan ciertas cantidades de materias organicas, en estas circunstancias y teniendo la luz, calor y humedad convenientes, est6 en condiciones de sostener las plantas, bien silvestres, bien cultivadas. Las rocas se descomponen por acciones quimicas, fisicas, meteorol6gicas, y de vida vegetativa y animal, pero nosotros mec6enicamente podemos producir una tierra 6 cosa bastante parecida; para ello moleremos lo m6s finamenteposible pedazos de una 6 mis rocas, obteniendo un polvo mas o menos granuloso, segin haya sido mis 6 menos perfecta la moledura. Si tomamos una porci6n de este producto que hemos obtenido y colocindolo en un tiesto de fondo perforado le empezamos d aplicar agua en cantidad medida, veremosque llegard un momento de saturaci6n, 6 sease que nuestro polvo de piedra no resiste ya mis aplicaciones de agua, no la retiene, sino que el liquido se presenta por las perforaciones del tiesto. Si anotamos la cantidad de agua que hemos aplicado al polvo de rocas contenido en el tiesto, y luego tomamos del mismo polvo otra cantidad, colocindolo en otro tiesto, pero, en segunda operaci6n mezclando con 61 cierta cantidad de abono de establo, veremos al aplicar el agua que 6std segundo tiesto resiste una mayor cantidad del liquido sin que este se presente por las perforaciones del fondo. Este sencillo experimento nos. demostrar6, que las. sustancias org6anicas, como parte de la tierra, aumentan su capacidad absorvente con la relaci6n al agua, y si continuamos nuestra experiencia preparando otros tiestos con cantidades crecientes de materia org6nica, veremos que la cantidad de agua que absorven, y retienen aumentar6 progresivamente en raz6n directa de la mayor suma de tales materias org6nicas agregadas al polvo de piedra 6 roca. Tambidn podemos observar que segin aumentamos. la cantidad proporcional de materia org6nica, esa piedra molida tomar6 un color mis oscuro, asimismo en raz6n directa de la mayor cantidad de materia org6nica agregada al polvo de piedra del tiesto, poni6ndose primeramente parduzca,. para terminar en volverse negra completamente. Si terminado nuestro experimento nos trasladamos un terreno de sabana, pr6ximo 6 un bosque 6 monte, en muchos casos podemos observar que la tierra de esa sabana es igual 6 la del monte, salvo que su color es m6s claro; y si Ilevamos muestras de ambas tierras 6 urT laboratorio para sometertas al an6lisis, el resultado de 6stos nos demostrar6d que SI SON IGUALES en cuanto 6a sus componentes miheral6gicos, pero que teniendo. el del bosque materias org6nicas, y no teniendolo el de la sabana, sus condiciones fisicas NO SON IGUALES. A la simple vista podemos apreciar que la tierra det bosque es mas oscura y la de la sabana tiene un color m6s claro; veremos asimismo que no son iguales las plantas que crecen en la una y en la otra tierra; veremos que tomando una porci6n de tierra del bosque en la mano y apretandola es coherente, no asi Ia de la sabana, la que sometida 6 la presi6n de la mano no resiste, sino que se disgregan sus particular buscando salida, para caer al suelo, por entre los-dedos de nuestra mano. Si le preguntamos al qufmico que hizo et an6dlisis qu& diferencia ha hallado entre ambas muestras de tierra,. nos dir6d que la del bosque contiene una cantidad considerable de materias org6nicas, 6 la que 61 le dar6, el nombre de HUMUS, y que la tierra de la sabana es en esta sustancia bastante pobre; tambien nos dir6 que la tierra del bosque contenia una porci6n grande de agua y la de la sabana no tenia de 6sta. Si tomamos una porci6n de tierra del bosque y coloc6ndola en una vasija la sometemos al fuego, 6a poco veremos que de ella se desprende algo asi como vapor y asi ser6, pues la parte de agua que contiene pasar6 por la acci6n del fuego 6 tal estado, y continuando la operaci6n veremos como despu6s los vapores que de ella se desprenden ser6n m6as y mas oscuros, hasta que podamos ver claramente que esta tierra se est6 quemrnando. Si hacemos igual operaci6n con la tierra de la sabana observaremos iguales fen6menos, pero en escala muy menor, prueba de que en ella existe menor cantidad de humus y por tanto de agua. Si examinamos diferentes porciones de una sabana veremos que en aquellas partes por eventos casuales, bien por ser m6s bajas, bien por estar protegida por la sombra de algn 6rbol, bien por estar entre dos trillos, quedan porciones de ellas sin quemar, hay alli mayor cantidad de pasto, la yerba alli crece con mayor lozania y examinando esta yerba con detenci6n, veremos que ay en ese lugar yerbas de otras clases que no se encuentran en la sabana limpia, por donde afio tras aiot pasa la candela, veremos que en lugar de la zanca de grullo, yabuna, espartillo y otras yerbas que ninguna res come, existe la pajilla, el cafiamazo, la yerba de oveja y otras, todas tiles y que proporcionan abundantey nuItritivo alimento al ganado que de ellas pasta. dificultad la candela, y en ellos hallaremos mejor variedad de yerbas y estas distintas 6a las que crecen sabana adentro. Toda planta tiende A adaptarse A las condiciones en que vegeta, resultando que en la lucha por la vida, sucumben unas bajo adversas condiciones y otras persisten, pero raras veces podemos hallar plantas litiles persistiendo en condiciones adversas, consecuencias de pobreza del terreno y pobreza de agua; antes al contrario; esto lo podemos comprobar viendo la vegetaci6n de nuestra sabana, pues alli donde se presenta con color claro, blanquecino, solo hallaremos plantas de tallos y hojas duras, yerba sin jugo y porci6n de tierra desnuda de toda vegetaci6n. Plantas tales como el Carrasquillo, el Espino, el Jamagiley, el Guao de sabana, la Yuraguana, el PaloLronco y otras parecidas nos indicarain por su escasez de hojas, por tener 6stas duras, brillantes y de poca superficie, que se han adaptado al medio en que se hallan colocadas, reduciendo A un minimo la superficie evaporante, consecuencia esta de la escasez de agua que es caracteristica del terreno en que vegetan. -poco a poco la tierra ira tornandose nmas oscura de color, y paulatinamente irAn presentaindose en ellas plantas de otras especies cormo tambi6n se irAn aumentando el tamafio, y por lo tanto, la superficie evaporante de las hojas de esas plantas que alli crecen. Este resultado podemos activarlo aplicando al dicho terreno abonos organicos, sembrando en ellos plantas leguminosas, roturindolas 6 sometiendolas A la irrigaci6n, siendo cualquiera de estos m6todos de renovaci6n lo bastante para demostrar hasta la evidencia que NO ES TAN MALA LA SABANA POR SER TAL, SINO POR CULPA DEL HOMBRE QUE ANUALMENTE LA QUEMA. Unfortunately we are not all blessed with an abundance of good water on our farms in Cuba so I beg to give a few details how to build a cistern for family uses. First select a high knoll near the house, preferably near the kitchen for convenience. A raised surface is essential as by building in a hollow, or even on a level, surface water will spoil the contents of the eastern. After deciding on the spot for building, say eight feet in diameter by eight feet deep, drive a stake about one foot long by three inches diameter in the centre, then take a pole some five feet long and drive two spikes one near the end, and the other four feet distant and into the stake already driven into the centre of the plan. This is called a travel and will give a perfect circle with a diameter of eight feet. The best and strongest form of cistern is the circular with a deep bowl shape. The builder should take great care not to make the declination from the top wall to the centre of the bowl more than one inch per foot of depth; this I have found gives the best results. After it is dug a mattock should be used to smooth the walls. It is highly important that the mixing of the materials be properly done, in fact, the whole work should, be done thoroughly. I find that five parts of fine sand to one of cement for the first coating, and three to one for the second answers admirably; a coarser sand may be used to -finish the top. The whole work will require about two barrels cement. Work over the cement at least three times before adding water, and then three times afterwards in order to have it thoroughly mixed. It should be soft enough to fill all crevices and holes of the walls so as to thoroughly avoid any subsoil pressure to injure the ,cement wall. The final plastering should be made of .d mixture of pure cement and water and applied with .A whitewash brush. The top, or roof is composed of two main timbers ,each six inches diameter placed crosswise resting on the top of the cement wall and projecting a little out on to the soil. Around the top of the wall build a row of stone six inches high and which will be level with the timbers. Then several small timbers should be built in to reinforce the roof coming to a gradual raised point in the centre; an opening two square feet should be provided for. The overflow pipe must not be omitted. Procure a perfectly round stick about twelve inches long, and two inches diameter, around which roll a thick piece of tin and build into the wall at the height you wish with good cement and out to the end of it in the-shape of a cane. When dry it may be removed, but it is advisable to leave it in'loosely at all times to prevent the entrance of insects, etc., into the cistern. By building strongly the cistern will last for many years, and will cost the small sum of sixteen dollars only. One cannot afford to be without a good supply of pure water, and this will give it to you the year round instead of having to haul it from the river or other questionable sources. reap the high prices of the local, and northern marikets. We want an abundance of good water to carry our crops through the dry season, then the problem of our future is solved. Desgraciadamente no todos los que poseemos fincas; de labor en Cuba podemos disponer de un buen surtido de agua y por lo tanto me propongo dar ciertos detalles en cuanto al modo mis f6cil de hacer una caja de agua para lsos dom6sticos. En primer lugar se escogera una situaci6n alta, un lomet6n, cera de la casa y mas aun de la cocina por ser alli mis conveniente. La situaci6n elevada es esencial, pues fabric6ndose sobre lo llano 6 en una depresi6n del terreno las aguas de las lluvias, depositindose en las. capas superiores del terreno y luego filtrando hacia la caja de agua pueden echar 6a perder el contenido de 6sta. Despu6s de determinado el lugar para la obra y fijadas las dimensiones de esta, por ejemplo 8 pies de didmetro por 8 de profundidad, procederemos 6A clavar una estaca como de un pie de largo por tres pulgadas en di6Ametro en el centro del lugar escogido; tomaremos asimismo una vara 6 tabla de cinco pies de largo y clavando una puntilla gruesa en su estremo, con distancia de cuatro pies se clavar6 otra, la que se aplicar6 al centro de la estaca. Esto nos resultar6 un aparato denominado (traza circulog, el que haremos girar alrededor de su centro y marcar6a en el suelo con la puntilla del extremo un circulo de ocho pies de di6Ametro. paredes de tierra se alizarin con un azad6n 6 con pico de pala. Es sumamente importante la preparaci6n de los materiales, y aidn mis, todo el trabajo debe de hacerse con cuidado y pericia. En mi pr6etica he hallado que la mezela de cinceo partes de arena fina por una parte de cemento para la primera capa 6 torta, y de tres por una para la segunda, da los mejores resultados; para la parte superior 6 brocal puede usarse arena m6s gruesa. Para toda la obra se necesitar6n unos dos barriles de cemento; revu6lvese 6ste bien (el cemento y la arena) por lo menos tres veces antes de agregarle el agua y luego otras tantas veces despues para que el todo quede bien unido; ha de quedar la mezcla lo bastante liquida para que pueda penetrar y llenar todas las grietas y hoyos de la pared de tierra evitando de tal manera la entrada del agua de filtraci6n que dafiaria la pared de cemento; para la iltima mano se usar6d una mezcla 6 lechada de cemento puro y agua, la que se aplicar6d con brocha como cualquier otra lechada. La cubierta 6 techo se formar6d con dos piezas de madera de seis por seis pulgadas colocadas en forma de cruz y apoyadas sobre el brocal y avanzando algo sobre el terreno natural; sobre este y contra el brocal se formar6 una pared de piedras de seis pulgadas de alto para que quede al nivel de las piezas de madera; de una 6 otra de estas piezas se colocarin otros maderos para refuerzo del techo, tratando de que el todo quede algo elevado hacia el centro y que alhi quede una abertura como de dos pies de cuadro. c6nica 6 de mayor a menor y una vez fraguado el cemento puede retirarse de la envoltura de hoja de lata, aunque convendria dejarlo alli colocado flojamente para evitar la entrada de ranas 6 insectos d la caja de agua. Haciendo un trabajo bueno y fuerte tal caja de agua podra prestar servicios por muchos aios sin tener que cargar agua del rio, cafiadas 6 pozos cuyas aguas pueden ser malas. El labrador que pueda contar con agua en abundancia en su finca y si 6sta es suficiente para la irrigaci6n pued 3 decir que tiene asegurada una fortuna, pues le proporcionara una cosecha de frutas (naranjas) en el mes de Junio cuando los precios de tales son altos, y no solamente esto, si que tambi6n le permitird cultivar de todo obteniendo cosechas fuera de tiempo y aprovechar buenos precios en los mercados locales como tambi6n en el del Norte. Necesitamos abundancia de buena agua para ayudar d nuestras cosechas en el periodo de la seca; teniendola, el problema del futuro est6 resuelto. When in Rome do as the Romans do is very applicable to the English speaking. people who have left their native lands and cast their lot in this foreign land among people with a different language and differen ways of living. Some of the newcomers find fault with the ways of, the Cubans; with the ways of the government, in fact, some find fault with. everything, but it appears to me that the Cuban feels toward us as we would were he to come to our homeland and find much fault. We would say, and with much reason, ((Mr. Cuban why do you come here with your troubles; if you do not like our ways and government go back to your own land))! Should then we object when they think the same of us? We are here, we like the climate, and the products of the soil, and many of us have more material interests here than elsewhere, and these latter are not easily disposed of. We find it hard to convert them' into cash as some would like to do so they can hie away to more congenial communities. Since we have driven into the mire we must put on more power, more energy, and more determination to pull through to prosperity and a beautiful happy home. How are we to do this? It is necesary to conform more to Cuban ways and customs, and to learn the Spanish language so we can do business with our Cuban neighbors, and the merchants with whom we trade. society. There are many fine people among them and we should do well to form acquaintanceship with them for mutual benefits. How are we to do all this unless we know the language?. Have them learn English?. No, 'because, we can learn their 'language easier, besides, their language is the native one, and it is up to us to do the digging if we would live a round life here. When we make up our minds to accept the Cuban people as we find them, and conform to their ways, learn their languiage, deal with them kindly and honestly, then shall we be on the road to prosperity. Dont say you are too old to learn new tricks, or a new language. Set to it with a will; mingle- with them; visit, and trade with them, and learn a few words every day, and soon you will be surprised to find yourself conversing with them without fear, and have the inward satisfaction which is hard to describe. This will immediately place you on a different basis with your surroundings, and life itself will be prettier to you as you are now two men with two mental horizons, and this double personality will bring you the prosperity you have long sought for in your narrow, and sin gle sphere. Learn the Spanish language and you will never regret it. ((Al pueblo que fueres, haz lo que vieresp, es un refrin muy aplicable d la gente de habla inglesa que ha salido de su pais para vivir en este pais extranjero entre gente de distinto idioma y costumbres. SAlgunos de los recienvenidos encuentran faltas en las costumbres del cubano; en las cosas del gobierno, de hechos, algunos encuentran que todo es deficiente. Por esto me parece que los cubanos piensan de nosotros lo mismo que nosotros pensariamos de ellos si fueran A nuestro pais y encontraran muchas deficiencias. Entonces diriamos y con mucha raz6n: ((Sefior cubano 4por que vienes d nuestra tierra con tus quejas? Si no te gustan nuestras costumbres ni nuestro gobierno, vublvete d tu pais.) Tenemos derecho d quejarnos si.ellos piensan de la misma manera de los extrangeros cascarrabias? Estamos aqul; nos gusta el chima y los productos del suelo y muchos de nosotros tenemos mas intereses materiales aqui que en otras partes, bienes.varios que no son fMcilmente vendibles y que no pueden convertirse con facilidad en dinero, como algunos desearian para irse a vivir a.su pals mas compatible con sus deseos. Sobre todo, ya que estamos de Ileno metido en el negocio, pongamosle mas fuerza, mas energIas y mas determinaci6n para llegar 6 la prosperidad y d un hogar feliz y hermoso. IC6mo haremos esto? Es necesario adaptarse mis A las costumbres cubanas y aprender el castellano de manera que podamos hacer negocios con nuestros vecinos cubanos y los comerciantes con quienes tratamos. benios ser aptos para hablar el idioma bastante bien para hacer nuestros negocios y entrar en relaciones soclales. Hay muchas personas agradables entre los cubanos y nos convendria tratar conocimiento con ellos para beneficio mutuo.' C6mo vamos tener todo esto si no sabemos el idioma? ZDici6ndoles que aprendan el ingl6s? No; es para nosotros mucho mas fdcil aprender el espafiol, y ademas su idioma es el del pals y es por consiguiente cuenta nuestra el trabajar para hacer una vida mis completa aqui. Cuando nos decidamos d aceptar al cubano tal y como es, adaptindonos d sus costumbres, aprendiendo su idioma, tratindolo bondadosa y honradamente, entonces estaremos en camino de la prosperidad. No digdis que sois muy viejos para aprender un nuevo idioma 6 nuevas maneras de vivir. P6ngase a ello son voluntad, mdzclese con los cubanos, trate con ellos, visitelos y aprenda cada dia algunas palabras, y vera como en poco tiempo usted mismo se asombra de encontrarse conversando con ellos sin temor y siente entonces una satisfacci6n interna dificil de explicar. Esto le colocard inmediatamente sobre una base diferente respecto del medio ambiente que le rodea; la vida en si misma ser mis grata, puesto que entonces es usted dos hombres con dos horizontes mentales y esta doble personalidad le traera la prosperidad que antes ha estado buscando en su extricta y simple esfera de antes. Aprenda el espafiol y nunca se arrepentird de ello. BY DR. EMILIO L. LUACES. VETERINARY SURGEON. In Cuba we have a highly lucrative business in the raising of pigs. The demand is always greater than the supply for the local market, and for the fattened animal very good prices are obtained. This demand is so great that pigs are imported weekly from the southern States for the Havana market. The natural richness of the soil of Cuba is prodigious, no country being so rich in nourishing foods for the raising of pigs where the farmer has at hand the natural fruits of such excellent food value as the palmiche, guayava, mije, and many other well known foods. On the farms devoted to pig raising are to be found natural resources of immense value which powerfully assist in the work of growing pig food, which is so costly in other countries, and for this reason they can be raised economically in the pen and obtain the highest prices on the market. What means, then, are necessary to improve the breed of our pigs to make the business still more lucrative?. In the first place we must avoid by every possible mcans the entrance of pen raised pigs into our markets from foreign countries for local consumption; and in the second place-dol ourutmost to -improve our present breed which, in the majority of cases is very defective indeed. It is very necessary to eliminate the ordinary type of pig with long snout, legs, and body substituting by means of proper selection and crossing with another and better type with short legs, and broad in body, and which when penned and fed will grow to be a large heavy animal. We earnestly recommend that breeders first study the- science of selection, being careful to select only the best boars which should be young, with short legs, and wide and long of body, and especially capable for the work of reproduction, castrating those which do not fulfill these conditions; and making the same careful selection of the female pigs. Every effort should be made to acquire pigs of the best breeds, each breeder doing what he possibly can in this good work and all working to the same end, that is the improvement of the breed of creole pigs which today does not produce what is really should. A pen fattened pig will easily reach 400 to 600 lbs. in weight, which fact we can prove as we have recently sold pure bred pigs weighing 600 lbs. live weight from the pen. Also, a half bred pig under the same circumstances will reach a weight of from 400 to 600 lbs. These pigs do not cost 'more to raise than the common Cuban breed which never reaches such figures in weight. With regard to the pure bred* animals that we kno w, and which in our judgment are the most adaptable to this climate and soil we would qaote for the benefit of our breeders the Berkshire, Tamworth, and, Poland China which we, have raised with very satisfactory results. Our breeders should obtain a few boars of these high class breeds which, in our judgment, will acclimatise very well indeed; cross them with the creole sow and they may be assured that the results will be a notable improvement of the present, Cuban type of animal. En nuestro pais constituye un negocio altamente lucrativo la cria de cerdos, pues en'el mercado dombstico alcanza siempre buenos precios el cochino cebado, siendo ademas insuficiente la producci6n actual, que no satisface la demanda, como lo demuestra el hecho de importar semanalmente un buen nimero de cochinos cebados para el mercado de nuestra capital donde se reciben numerosos coehinos procedentes del sur de los Estados Unidos. La riqueza natural del suelo de Cuba es prodigiosa, no se encuentra ning6n pais tan rico en substancias alimenti2ias adecuadas 6 la alimentaci6n del cochino como sucede en el nuestro, donde el criador de cerdos tiene 6 su alcance los frutos naturales de tantisimo valor alimentieio como son el apalmiches, la ((guayaba, el (mije)) y otros muchos bien conocidos de nuestros criadores. En nuestras fincas destinadas 6 crianza de cerdos existen recursos naturales de inmenso valor que contribuyen poderosamente 6 la labor, siempre costosa en otros pauses, de buscar, labrando la tierra, el alimento de los cochinos: aqui, en suelo de Cuba, los alimentos del cerdo no resultan tan costosos como en otros paises y por eso precisamente se puede criar econ6micamente el cochino, que una vez cebado alcanzard en el mercado precios altamente lucrativos. tranjera con destino al consumo, y en segundo lugar tratar de todas maneras de mejorar el tipo de nuestro cerdo criollo 6 del pais, en su. inmensa mayoria muy deficiente. Es preciso eliminar este tipo de cochino tan corriente, de hocico y patas largas y cuerpo alargado, sustituy6ndolo por medio de la selecci6n y el cruzamiento por otro tipo de cochino que sea de hocico y patas cortas y de mucha caja, capaz de alcanzar un gran peso despu6s de cebado. Al efecto, recomendamos 6 los criadores de cerdos,en primer lugak, que sean aficionados 6 la selecci6n, que escojan siempre los berracos sementales de mejor conformaci6n, que sean en todos los casos berracos nuevos de patas cortas, de mucha caja y de buena vara, los que pongan al frente de la importante labor de la reproducci6n, castrando aquellos berracos que no reunan esas condiciones, haciendo igual seleccion en cuanto se relaciona 6 las puercas madres, y en segundo lugar, que traten de adquirir algunos berratos de raza puras, cada uno al alcance de sus fuerzas, pero todos laborando en igual sentido, que es asi de Ia finica manera que se logrard mejorar el tipo de nuestros cerdos criollos, hoy muy deficiente, raz6n por Ia cual tan importante cria no produce lo que realmente debia. Un cochino de raza pura alcanza f6cilmente despues de cebado un peso de 400 6 700 libras; esto pademos f6cilmente comprobarlo, pues recientemente hemos vendido cerdos de raza pura, con un peso de 600 libras en pie al terminar Ia ceba; un cochino de raza 6 media sangre f6cilmente alcanza de 400 6 600 libras en pie y su ceba no cuesta m6s que Ia de un cerdo corriente que nunca alcanza ese peso. ((Berkshire)), ((Tamvorh)) y (Poland China)), las cuales hemos criado con resultados muy satisfactorios. Traten nuestros criadores de obtener algunos berracos de estas razas puras, que a nuestro juicio se aclimatan muy bien; introduizcanse en la cria del pais, en la seguridad de obtener resultados muy prdacticos de semejantes cruzamientos que vendrdn a mejorar notablemente el deficiente tipo del cerdo criollo. OBSERVATIONS ON THE EFFECTS OF CLEARING FOREST LANDS, AND PLANNING FOR PLANTING. It is the general custom in our country among the landed proprietors who still possess forest, or wooded lands, to clear them without previously having them surveyed as to the general conditions of natural drainage, merely making, at most, the simple lines of demarcation with the axe and machete which serve as a means of determining the area cleared by the contractors, and also to give the general situation of the land for planting, especially when cane is to be planted. The operation of this system causes very serious inconveniences which increase according to the high level of the land, that is to say, the lower the level the greater will be the injuries occasioned at present, and in the future. The landowner should take into consideration that every tree is a natural apparatus of absorption, a pump a fact that not only refers to trees, but also to al1 vegetation; they take the water from the soil and evaporate it through their leaves.